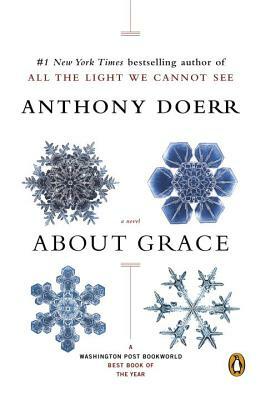 Anthony Doerr is the author of the New York Times #1 Bestseller All the Light We Cannot See, named one of the best books of 2014 by the Washington Post, NPR's Fresh Air, and The New York Times Book Review, among others. The Los Angeles Times called his stories in The Shell Collector "as close to faultless as any writer--young or vastly experienced--could wish for." About Grace, his first novel, has been hailed as one of the most compelling and entrancing novels of recent times. David Winkler begins life in Anchorage, Alaska, a quiet boy drawn to the volatility of weather and obsessed with snow. Sometimes he sees things before they happen--a man carrying a hatbox will be hit by a bus; Winkler will fall in love with a woman in a supermarket. When David dreams that his infant daughter will drown in a flood as he tries to save her, he comes undone. He travels thousands of miles, fleeing family, home, and the future itself, to deny the dream. Anthony Doerr is the Pulitzer Prize-winning author of All the Light We Cannot See. His stories have also appeared in numerous publications, including the O. Henry Prize Stories, Atlantic Monthly, Zoetrope: All Story, and The Paris Review. His first book, The Shell Collector, was published in 2002 and recently was awarded the Barnes & Noble Discover Prize and the New York Public Library's Young Lions Award.He lives in Boise, Idaho where he teaches M.F.A. students at Boise State University.